(Newser) – The Coast Guard is considering setting the gigantic oil slick in the Gulf of Mexico ablaze as it approaches land. A controlled burn to burn off the oil could happen as soon as today if winds keep pushing the Rhode Island-sized slick toward ecologically sensitive areas of the Mississippi Delta, CNN reports. "We fully understand that there are benefits and trade-offs" in torching the slick, the admiral co-ordinating federal operations told the New York Times. Birds and mammals will be "more than capable" of handling the effects of a burn, which will remove most of the oil and leave a waxy residue, said a Coast Guard spokesman. This story really scares me. When I said what next? I mean how far can "government" agencies go to correct major screw-ups like this. 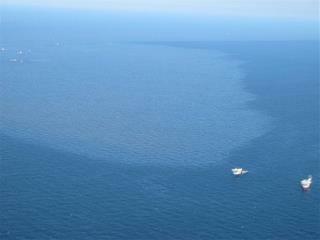 Setting an oil slick the size of Rhode Island sounds like a horrifying solution to an immense man made disaster. Wow they have the technology to extract oil from hundreds, even thousands of feet below the sea but have no backflow valve no cut-off valve...really! It's like the world's dumbest plumber engineered these stations!